Fortane™ Wood Flooring Adhesive Systems consists of environmentally friendly adhesives, moisture protection and acoustical adhesives, a moisture vapor membrane and an adhesive cleaner. 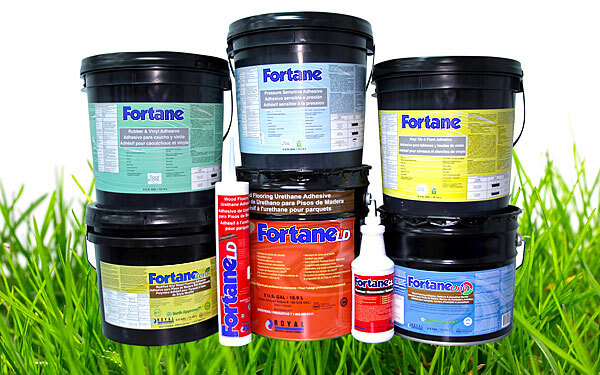 Fortane™ products are specifically developed with high-performance features that meet the needs of installers, contractors, builders, architects, and homeowners alike. The Fortane™ line of products are designed to work extremely well together for a trouble-free set up, installation and clean up; leaving a finished product that will require no call backs. The Fortane™ team of specialized sales, technical & customer service staff are prepared to respond quickly to your needs to ensure that our product is ready for you when you are ready for the job. The Fortane™ line of products is developed with the environment in mind. Fortane™’s Earth Approved™ initiative ensures that our products meet the specifications set out by green organizations. We strive not only to meet local regulations, but also global standards.